ADDRESS OF MISS JANE ADDAMS. 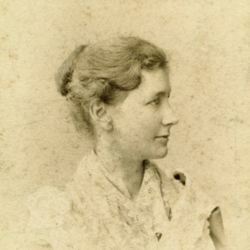 Mrs. Mead, Ladies and Gentlemen: Peace, during the last century, has had friends and promoters in three distinct lines. The first line, as it ought to have been, was the line of the preachers, which, of course, was best represented by your own Channing. They preached peace as a dogma, as a creed. They made an appeal to the sense of righteousness, which we all have somewhere within us, and they urged people to refrain from war and to follow the paths of peace. It was a noble dogma, but, as we know, dogma, as such, belongs more to the last two centuries than it does to this twentieth century. It belongs with the doctrinaire and the scholar. Then another set of promoters of peace may be best represented by two great Russians. They were the persons who appealed to the sense of pity. Tolstoy in his work entitled "Peace and War" takes us through a long campaign, not with the officers who pore over maps, but with the common soldier, with poor old Pierre, who does not know what it is all about, who is hustled from one camp to another, who tries to fight when other people fight, who, when he is hit, feels very much grieved and is sure that the French do not know who he is or they would not try to kill him. The other great Russian, who has made this appeal to pity, has put before us war with all its wretchedness, with all its disease, with all its squalor. These perhaps more than any other two men have stripped war of its glamour]. Then come the third line of promoters, and, curiously enough, they are best represented, again, by a Russian subject. These promoters appeal to the sense of prudence; they say that property is a valuable thing, that it represents human bone and muscle. Mr. John de Bloch has written almost a library on this subject. 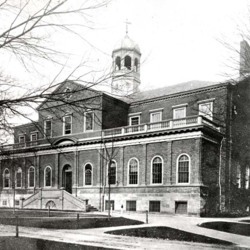 Mrs. Mead has done much to make this point clear to the American mind when she tells us that one warship costs more than the entire grounds and buildings of Harvard University. 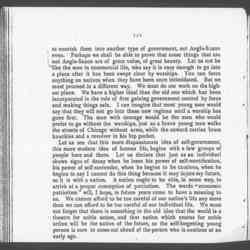 We now come to a new point, and we ask ourselves if there is not something more in accord with our present line of thinking, which may be said of this cause of peace, something a little more active and practical, less theoretical and sentimental than some of the old preachings of peace necessarily had to be. I am very fond of Tolstoy, but I always wince when I hear people call him a non-resistant. The word is too feeble. 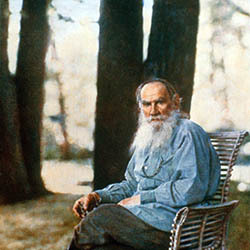 Tolstoy yearns to see a great display of moral energy in the resistance of evil. It is only brute force which he discards. If your own Professor James were expressing it, he would say that Tolstoy is trying to create new springs of energy, because he tells us that through the paths of righteousness are called forth the very best powers of mankind. Let us say that some great country,-- only a few years ago we could not have illustrated it from America, and perhaps it is better now not to illustrate it from America,-- let us say that the British have gone into a new country, into a virgin country, and that [page 2] they wish to bring to it the blessings of civilizations and self-government. What does the soldier do? He says, "We must establish law and order. We will do it by peaceful means first, but if we cannot do it that way, we will do it at the point of the bayonet." In the process of establishing law and order he may crush out the very beginnings of self-government. He may kill the most precious germs of some new exotic contribution to the science of human government which this simple people were making. 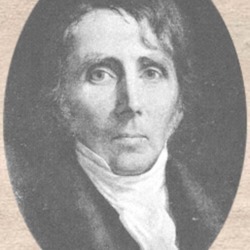 If he were a believer in the creative energy of mankind, if he understood that all progress must come from the native soil, he would say, "I will watch this thing; I will nourish it; I will be careful not to impose upon it old and possibly worn out ideas." He would try to bring it new riches of human interest, new powers of human development. He would have to develop the most wonderful thing in the world, a new combination of people coming together in the line of self-government. It seems to me that the power of soldiery is impotent if it employs the old-fashioned instruments that have been used for thousands of years. It is easy to kill a man. It is not easy to bring him forward in the paths of civilization. It is easy to have one broad road such as the British have laid out, and to say, "Some people are at this milestone, other people are at that milestone." But we know that civilization is no such thing; that it has no metes and bounds, but that it advances along devious paths. A man has not begun to read history aright, he does not know the very first rudiments of human life, if he imagines that we are all going to march down one narrow road. 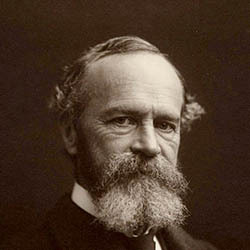 If we could only convert our men and women, and make them see that war is destructive, that peace is creative, that if a man commit himself to warfare he is committing himself to the played-out thing, and not to the new, vigorous and fine thing along the lines of the highest human development, we should have accomplished very much. There is one moral pit into which we continually fall, a sort of hidden pit which the devil digs for the feet of the righteous. It is that we keep on in one way because we have begun that way, and do not have presence of mind enough to change when that path is no longer the right one. The traditional way, the historic way, is the way the Romans used when they went forward into Europe and levied taxes and then bought back to Rome all their treasure and all their finest blood. That is the easiest way. But if we have the spirit of moral adventure, if we believe, as we pretend to believe in America, in democracy, then we shall be ready to take another course, even if it be much more difficult. I do not believe people can say that we no longer believe in democracy in America, but they can say that we no longer trust democracy. Almost every state in Europe has established forts in Africa or Asia or some other place. It seems to me that here in America is the place for experiment. Let us say, "We will trust the people although they are of a different color, although they are of a different tradition from ours. 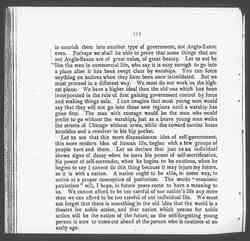 Perhaps we shall be able, through our very confidence, [page 3] to nourish them into another type of government, not Anglo-Saxon even. Perhaps we shall be able to prove that some things that are not Anglo-Saxon are of great value, of great beauty. Let us not be like the men in commercial life, who say it is easy enough to go into a place after it has been swept clear by warships. You can force anything on natives when they have been once intimidated. But we must proceed in a different way. We must do our work on the highest plane. We have a higher ideal than the old one which has been incorporated in the rule of first gaining government control by force and making things safe. I can imagine that most young men would say that they will not go into these new regions until a warship has gone first. The man with courage would be the man who would prefer to go without the warships, just as a brave young man walks the streets of Chicago without arms while the coward carries brass knuckles and a revolver in his hip pocket. Let us see that this more dispassionate idea of self-government, this more modern idea of human life, begins with a few groups of people here and there. Let us declare that just as an individual shows signs of decay when he loses his power of self-mortification, his power of self-surrender, when he begins to be cautious, when he begins to say I cannot do this thing because it may injure my future, so it is with a nation. A nation ought to be able, in some way, to arrive at a proper conception of patriotism. The words "economic patriotism" will, I hope, in future years to come to have a meaning to us. We cannot afford to be too careful of our nation's life any more than we can afford to be too careful of our individual life. 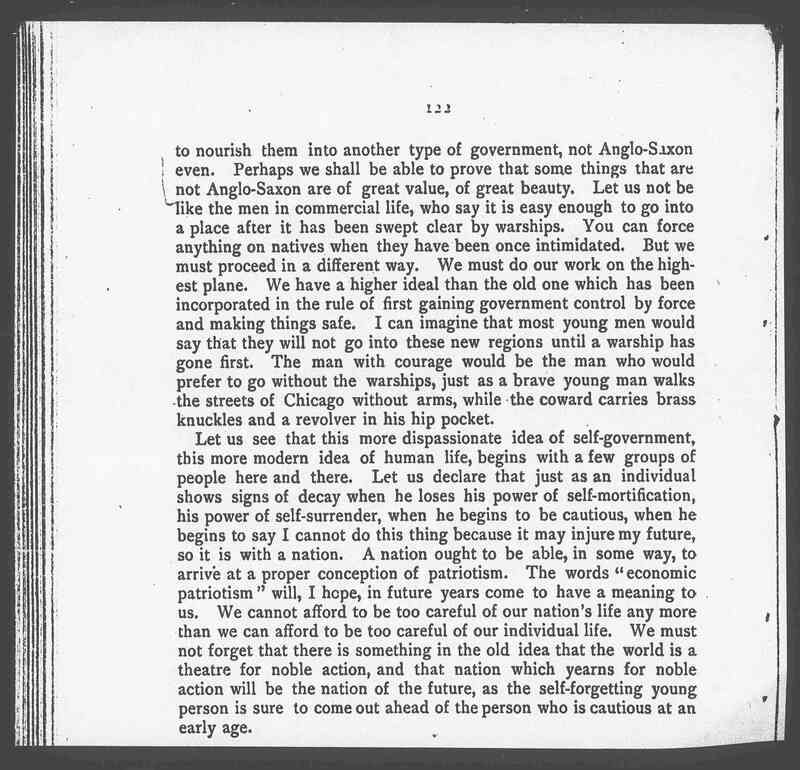 We must not forget that there is something in the old idea that the world is a theater for noble action, and that nation which yearns for noble action will be the nation of the future, as the self-forgetting young person is sure to come out ahead of the person who is cautious at an early age. 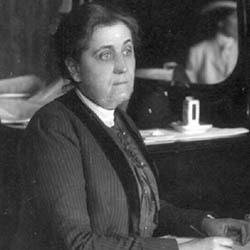 Addams discussed women's role in the peace movement at the Universal Peace Conference in Boston. 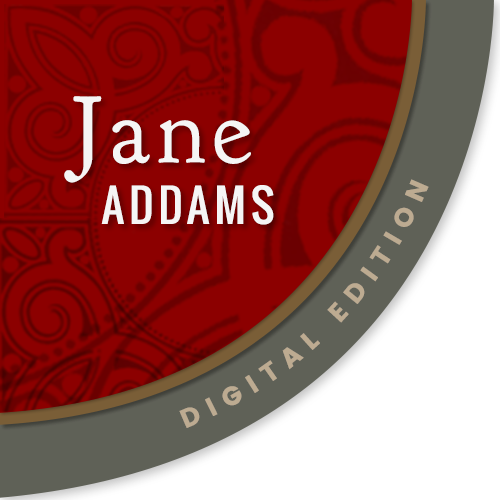 "Address of Miss Jane Addams," William J. Rose, ed. 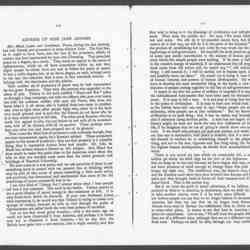 Official report of the thirteenth Universal peace congress, held at Boston, Massachusetts, U.S.A., October third to eighth, 1904. (Boston: The Peace Congress Committee, 1904), pp. 120-22. UPCOR-B -- William J. Rose, ed. 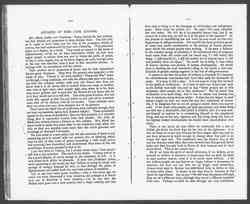 Official report of the thirteenth Universal peace congress, held at Boston, Massachusetts, U.S.A., October third to eighth, 1904. 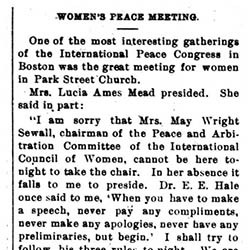 (Boston: The Peace Congress Committee, 1904). 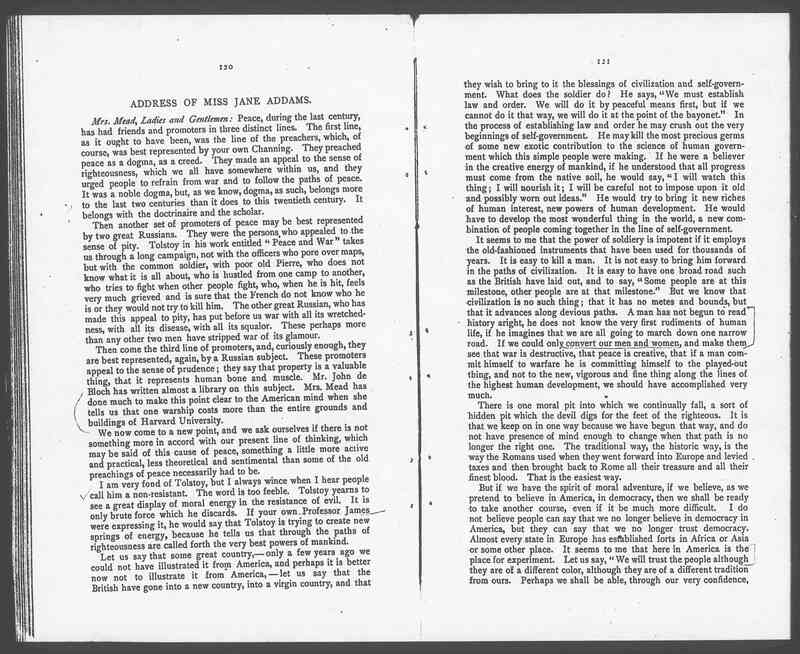 Adadms, Jane, “The Responsibilities and Duties of Women toward the Peace Movement, October 5, 1904,” Jane Addams Digital Edition, accessed April 25, 2019, https://digital.janeaddams.ramapo.edu/items/show/3552.